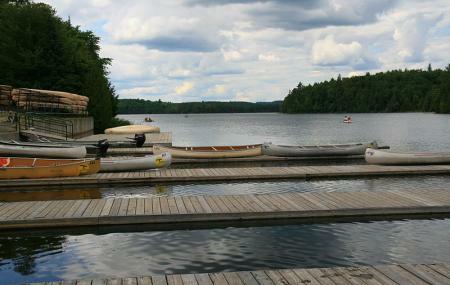 Nestled in Algonquin Provincial Park, Canada, Canoe Lake is one of the most favored destinations in the country for the canoeists. You will find many cottages around the Canoe Lake. There is a small road that takes one to the canoe Lake Access Point. This access point has a huge parking area, a Portage store, and a Ministry office. What makes the lake look so beautiful is the flower beddings that surround it. This is a great Lake to start on if you're heading into the interior. It's also a great Lake to paddle around on for a few hours if you're in the park camping and want to try your hand at canoeing or kayaking. Beautiful lake without a lot of human history. This is the first lake to the start of many canoe trips. Great lake to canoe on. A tad bigger, with a few islands, and great links to other lakes. You will find the Portage Store right off of highway 60, rent a canoe there and enjoy a little paddling!